One cannot visit Wales without experiencing a real sense of history. Millenniums of people have left their marks on the timeless landscape. The geographic position of Wales on the western fringe of Britain was of paramount importance to our cultural development. Contact with the outer world lay predominantly from the sea. Also, time and time again the mountain massifs of Snowdonia proved the final retreat of early settlers. Because of this and the relative lack of later urban and agricultural development the area yields rich pickings for the prehistorian . 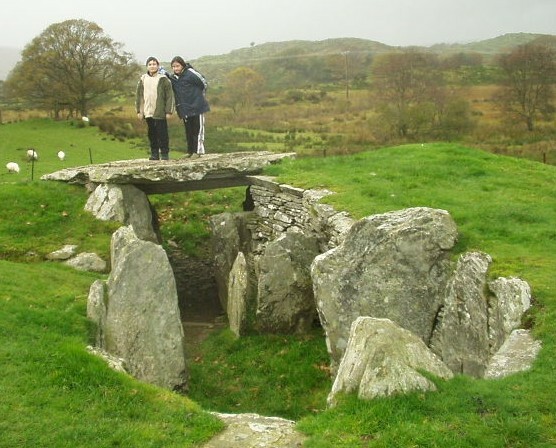 In the stone age the windswept coasts of Wales were probably some of the few open patches of Bodedern cromlech ground that a people with only a stone axe or antler pick could colonize when the rest of the land was covered with unbroken forests.So here we find fine examples of chambered tombs/passage graves -modern ancestors of the family vault.